Dark inheritance: Author/curator Karen Ishizuka will speak about the Japanese-American experience at UCSC on Feb. 9. Extreme racial profiling during World War II was not a strategy practiced exclusively by the Nazis. One of the most hushed episodes of U.S. history was the incarceration, commonly known as the "internment," of 120,313 Japanese-Americans, between 1942 and 1946, 70 percent of whom were born in the United States. Many of these people lost their land, their businesses and the sense that their country would keep them safe, all for the stated purpose of national security. Left out of the history books until after the ethnic awareness movements of the '60s and '70s, the occurrence and experience of the camps maintains its taboo even for the people incarcerated. 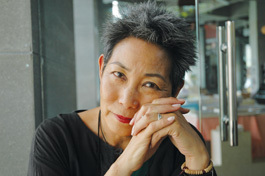 Karen Ishizuka, along with the Japanese American National Museum, mounted a participatory exhibit, "America's Concentration Camps: Remembering the Japanese American Experience," to both educate the public and offer an opportunity for Japanese-Americans to share how the camps affected their lives. Ishizuka wrote a book (Lost & Found: Reclaiming the Japanese American Incarceration; University of Illinois Press; $24.95 paper) documenting the time she spent working on the exhibit, and will speak at UCSC on Feb. 9 about the exhibit, the book and her experience of being a sansei, a third-generation Japanese-American. Ishizuka doesn't see racial profiling as a geographically removed, distant instance in history, but as a living threat, right here at home. Exhibit curators replaced the generic euphemism "internment camps" with the more specific term "concentration camps," a decision in diction that's consistent with documentation of how U.S. officials referred to the camps at the time. Because the term "concentration camp" is largely associated with the Jewish experience in World War II Europe, the choice of title raises questions of whether or not the incidental comparison is historically tactful. "You can't compare sufferings. And you shouldn't fall into that," says Ishizuka. "A lot of people say to us, 'Well, it wasn't as bad as the Holocaust.' Well, of course it wasn't as bad as the Holocaust! By calling them American's concentration camps, if anything we want to stand in solidarity and support of American Jews and other Jews throughout the world, to remember, so that something like this or the Holocaust or any other holocausts never happen again." Though Ishizuka sees parallels between the psychological effects of America's concentration camps and Europe's, she points out a very important distinction between the phenomena. "The Holocaust was perpetrated by a madman, right, I mean, Hitler was a dictator, obviously not a normal kind of person. This was done by the American government. And to think that our constitutional rights can be so easily taken away," says Ishizuka. "That happened in Nazi Germany, but this happened under a so-called democracy, where the constitution is supposed to be protective over their citizenry." For this reason, Ishizuka considers educating the public about the camps of dire significance, the occurrence serving an example of how U.S. officials can step over the Constitution, especially during war times. "An injustice to one is an injustice to all. If it can happen to one ethnic group, it can happen to other targeted groups, and it's happening now. You bring out the parallels with the past, and you bring out the parallels with the present, which is chilling as well. There are detainment camps. There are unconstitutional things going on now that we don't know about, just like they were happening in World War II and we didn't know about them." In her book, Ishizuka points out the racial profiling and emphasis on national security in the United States following 9/11, and also discusses issues surrounding Mexican immigration. "The exhibition opened one week after California voters passed the highly controversial Proposition 187, which denied public services to people who reside illegally in California," she notes. "Immigration and immigrants' rights proved to be as contentious an issue in the 1990s as it was in the early 1900s, when the California Legislature passed the Alien Land Law (1913), which made it illegal for aliens ineligible for citizenship to own or lease land. While the immigrant groups under attack were never named, the fact that the Alien Land Law targeted Asian Americans was as apparent as the fact that Proposition 187 targeted Latinos." Though Ishizuka was not incarcerated herself, many of her family members were. As a result, she has assimilated their experiences as a part of her own cultural identity. The continued grappling with this issue, a half-century later, demonstrates the long-term effects of American civil rights violations. "I inherited camp," she says. Karen Ishizuka will speak after the screening of the film 'Pilgrimage,' Friday, Feb. 9, 6:30-8:30pm, at Oakes Lecture Hall 105, UCSC; for more information call 831.459.4706.